And now for my project! I LOVE this skate! It totally takes me back to my childhood, I use to skate all the time in my backyard with my friends. The skate is now available to purchase at SVG Cutting Files. From Jaded Blossom I used Card Mat Dies, Star Dies and 100% Hipster stamp set. So cute and so much a part of my childhood ! Love the Kawaii roller skate! Awesome job! who doesn't remember the rolloer rink! Soo cute! We always went roller skating on sundays as a child....and within the last couple of years our skating opened back up, so it's fun to take my girls now! Super cute! Boy, that does bring back memories! Makes me want to go skating! Really cute! Cute skate. I can use these for daughter-in-laws roller derby pictures. Maybe without the smile. Fabulous file and adorable card - love it. This is just darling. Love the design and the sentiment. I still have my skates! They are old!! Love it! so cute!! I love all the colors and the skate is so adorable! Thanks for sharing and have a great day. so cute, i had skates that clamped onto my shoes! Love this card and the saying. Cute skate! Just completed the hop, wan, especially ted to say great job to everyone. Thanks! Sweet skate! I loved skating when I was a carefree kid! Brings back lots of memories. Love the bright colors. This is so fun and cute! Love your card. Love the skate file. very cute card! Cute card! Definitely brings back memories! beautiful - love the colours used! I love this! I grew up at the skate rink! Skating was my fav activity when I was a child and your skate project is just perfect! This totally brings back memories, skating with my sister. I loved skating with my friends at our local skating rink! super cute card Candace! 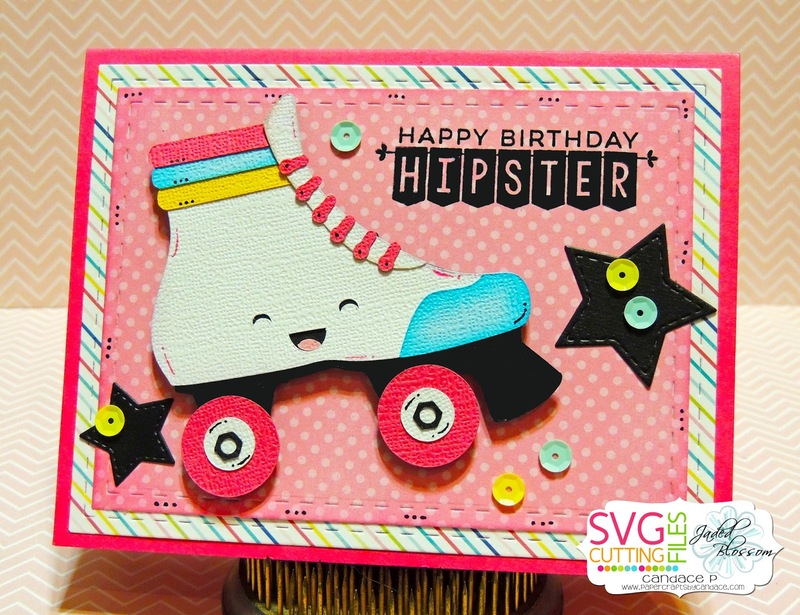 Love the bright colors and the skate! I loved these skates as a kid. Super cute!! Love, love, love this card so cute! I love your card, the skate it´s nice!!! I used to love roller skating! I can't remember how many birthday parties my friends had at the roller skating rink because there were so many!! I love those skates. Flashback to my childhood! Love the roller skate. I could see a lot of ways to use it. I never did catch on to skating . . . more like hanging on to someone and being dragged along! Cute project!!!! Great colours. Love it! Roller skating was one of the things we did when I was younger! Thanks for sharing! Cute skate card! My friend and I were just talking today about skating when we were kids. Too cute, loved your card! Oh my gosh that skate is the cuteset!! Soooo cute!!! Love the skate! Cute and love the colors used.